Love this cat box. It’s very quiet and there is no smell with the crystals. Not having to scoop one or two times a day is awesome. The box is always clean and ready to make sure your home always smells fresh. Really enjoy everything about this PerSafe Scoopfree Self Cleaning Cat Litter Box. 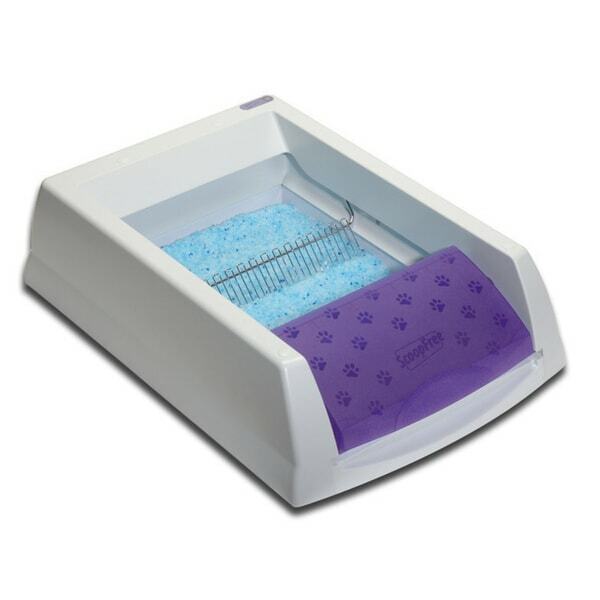 Maintain a clean pet area and keep your cat happy with a self-cleaning litter box by PetSafe. Featuring a disposable tray, this box gives you a hassle-free approach to eliminating pet waste. After reading all the reviews, I decided to go ahead and give this one a try. I used to have one made by a more well-known company, but it was loud and the motor blew out after only a year. This PetSafe litter box is quiet and, true to the advertising, it only needs cleaning about once every two weeks or so (with TWO cats!). The replacement litter pans are way too expensive, so I bit the bullet and bought the permanent one and I am not a bit sorry. Also, I happily discovered that the crystal litter is sold at my grocery store for a lot cheaper. A note about the crystal litter: It doesn't track nearly as much as regular litter or clumping litter. But, try not to step on any of it in you bare feet...ouch. I couldn't be more pleased with this product! This is the first time I have had a cat in years. I know the litter box is a big deterrent for a lot of people. This box makes owing a cat so much better. Each tray last me about 3 weeks. No one has ever smelled my cats box that sit very close to the couch. I LOVE IT! My cat loves it! Makes it easier for us to keep our home smelling clean and fresh. I got this for my mom on the recommendation from a friend. They've had theirs for 6 months and love it. It definitely makes my mom's life easier. I also ordered a couple of the plastic trays instead of the disposable that comes with it. Saves money. I love this PetSafe scoopFree Cat litter box. You have no idea the time I save cleaning the box and the no odour . I'm one really happy customer . !!! WHAT A GREAT LITTER BOX FOR MY CAT! I’m beyond happy with this purchase. What a difference having a self-cleaning litter box makes! Gone are the daily scoopings and the related smell that went along with the old litter box. I would definitely recommend this scoop free system! This has been a lifesaver for us. We have an older cat and she refused to use the old litter box with clay litter we tried new litter box tried all kinds of litter nothing worked. After getting this litter box no more poop on the floor!!! Yeah!!! We are very pleased with this litter box. I have 2 inside cats and 1 hates to use a dirty litter and was doing his business on the floor. Now that I have this he has been using the litter box perfect. I am sure it is because there is no odor, it cleans just as stated and the house and litter are odor free. We are a very happy cat family now! Love this item! I do not smell a thing. Love, love, love it! This is the way to go! I love this! Love the color! Scooping works great! Update since my cats diabetes has gotten under control. I upped it one star because it works pretty good for a normal cat. If you have a diabetic cat, keep moving. I did not find out until after I had bought it that it will only last a week or so for a diabetic cat. I went back to my clumping litter and bought a genie disposal (like they have for diapers) and it's working great. I'm not sure how it works for a 'normal' cat, but I can't imagine it last long with multiple cats. It's the urine more than the other stuff that isn't working, the crystals don't soak anything. Love the product.......hate to clean up that nasty, stinky kitty litter all the time, this product is great and quick to clean up. The litter crystals helps big time with the odor I just wish it wasn’t so much money for the refills. Doesn’t really work as described. Scraper does not clean up very well and the container that it scoops into is not large enough. There is no chore I loathe more than cleaning the litter box! With two cats, we have to clean it constantly. This has made life so much easier. Just set it and forget it. I imagine I will need to change the litter more than the recommended frequency as I do have two cats, but it's still far less work and no contact, which I love. My cats are 8 years old and set in their ways, so they were a little skeptical at first, but they got used to it pretty quick. We have some finicky cats and one of them old. In the past a dirty litter box, if it had been used by another cat, my fav girl would find somewhere else to do her business. This has been a blessing as there is no one home to have the litter box suitable for her use 24/7. Ordered the reusable tray as it seems less costly than than using the disposable. Love the simplicity of this cat box. Been toying with the idea of getting one of these. Cats seem to like it so far and I love not having to scoop. I’ve always been concerned about them scooping while the cats are still in it but it seems to have a good sensor. "Can the hood be purchased separately ?" Yes the hood is sold separately as item PAC00-14228. "Does cat touch the metal scooper pusher that goes around?" No, not made to to do so. "How much does the blue crystal litter cost? Is it more expensive than Arm and Hammer? Will Arm and Hammer litter work in this pan?" "Can litter purchased at the store be used with this litter box? How long do the disposable litter trays last?" I haven't tried other litter in this litter box. I like the blue crystal kind that comes with and new trays can be purchased. It depends on how many cats use it, but I would say 2-3 weeks before having to change the trays. I haven't noticed any order issues like I do with the clumping litter. I needed a ittler pan that requires less cleaning of the litter. "What are the litter crystals, where can I buy them and how much are they? Are they safe for cat? Can any other litter be used?" Hello coleedo, unfortunately, we are not in stock with the Premium Blue Crystals this item is prefilled with. This item is known as ScoopFree Blue Crystal Litter Tray. Thank you for shopping with us.